To do a good job cleaning windows it is important to have the right tools when you get started. Some of these tools also result in a safer window washing process for you, the last thing you want to do is end up in the ER just for some clean windows! Window Cleaning is a skill acquired by many hours washing windows, but even someone cleaning their first window can do a good job if they follow some basic guidelines. Harry Falk – A Blaine, Minnesota based window cleaning supply store. Windows101 – A Seattle, WA based window cleaning supply store. Squeegees – Either multiple complete squeegees in various widths, or one handle with multiple widths of channels. Regardless you want the right size channel for the window you are trying to clean so you are not making too many passes while washing the window. 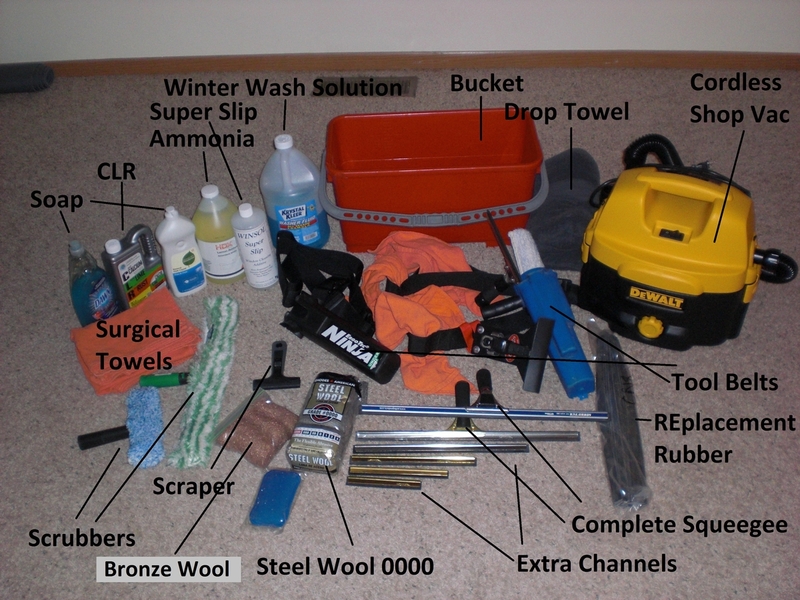 Tool Belts – Not 100% necessary, but something that can be very helpful to keep your hands free so you can wash windows. When window cleaning a good tool belt and squeegee holster can free up your hands and also have everything you need when washing windows when you are up a ladder. Buckets – You need some place to mix your window cleaning solution and wet your scrubber. Towels – We recommend 100% cotton surgical towels, hands down the best towels. I use a TON of towels when I am cleaning windows due to the fact I wipe down every surface when I am done and typically use one towel per two windows cleaned. Washer – Your standard 18” washer will work in “most” applications when window washing. If you have small windows you might want to pick up a smaller one, or you can use the end of your bigger one to wet/clean the window surface to start the window cleaning process. Scrapper/Scrubbers – Some windows while cleaning them require most more than a quick swipe with a Washer to get them clean. We use scrapers, scrubbing pads, and steel wool. Extension Pool – Every once in a blue moon there is a window that is simply too dangerous to get to with a ladder that you must use an extension pole to reach. Ladders – My truck has 6 different ladders I use for washing windows. Some windows are 30’ off the ground and require a VERY tall extension ladder, while other windows are only just out of reach and a small step ladder is all you need. Multi-ladders are also great for uneven ground and inside homes. Window Cleaning Solution – There is nothing special with what 95% of window cleaners use to wash windows on your home. Most guys I know use a couple of squirts of Dawn dish soap and away they go and it does a wonderful job! I personally mix a slightly different solution that I think helps me get your windows cleaner, but you can also go the basic route. Some window supply companies even have specially formulated “pills” that you can use in your bucket to take the thinking out of it. Sponge – Great to have when cleaning tracks and sills on windows and doors. Cordless Shopvac – Another great tool to have when trying to get tracks cleaned on windows and sliding glass doors. Large Towel – When cleaning inside another great item to use to make sure you are not creating another mess on your carpets while washing your windows. Mix up your window cleaning solution and get all your tools in order on your belt. Select the proper ladder for the window you are trying to reach. This is the most dangerous time for a window cleaner in that a ladder not firmly planted on the ground could slide out from under them. 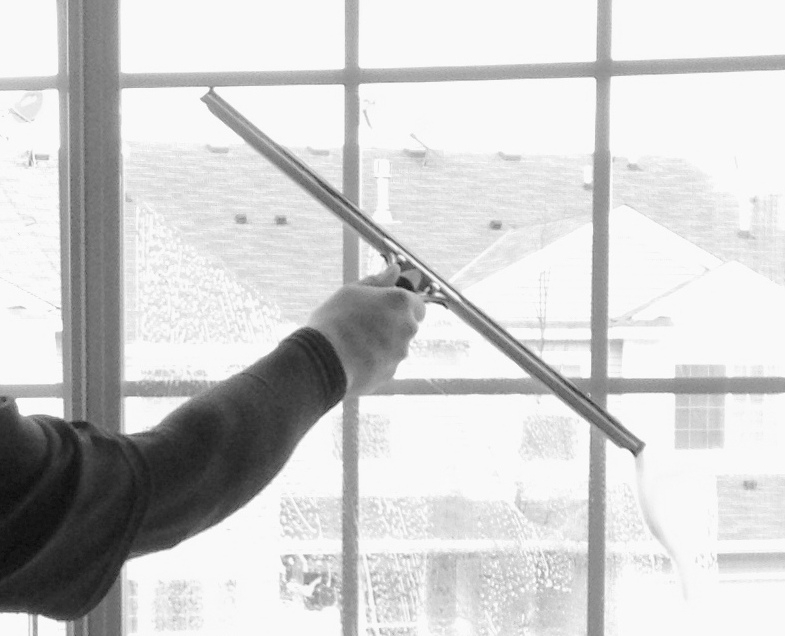 The first step in cleaning your window is to wash it with your scrubber, make sure to hit the entire window. Depending on how dirty the window you might need to further clean the window with either a scraper, steel wool, or scrubbing pad – If you do so re-wet the window with the scrubber before moving to step 5. Now grab one of your window cleaning towels and dry the top and left side edges of the window in preparation to squeegee the window. Time to squeegee the window; starting at the top you will work from top to bottom making sure you are collecting all cleaning solution off the window in the process. After you have used your squeegee to remove the water from the window grab your window cleaning towel and make sure to dry all edges of the window. Finally wipe down the sill of the window and make sure you are happy with how the window looks, if not start the process all over again. Now it is time to move inside to clean the windows, the only difference in the process is you will want to protect the flooring first with a towel or tarp. On most homes it is also the time you will remove the screens and wash them with either a rag or hose. REALLY dirty window screens can be first cleaned with a soapy solution and washed with a pressure washer and set off to dry in the sun.